On Sep 28, 2017, representatives of the US China Business Association attended the first “China US Social and Cultural Dialogue “, co-chaired by Chinese Vice Premier Liu Yandong and the US Secretary of State Tillerson, expressing full confidence for the next 50 years’ development of relations between China and US in business and cultural exchanges. Following the people-to-people dialogue, another important event the “Belt and Road” Initiative and “Make America Great Again”—the U.S.-China Business Forum took place on October 3, 2017 at Trump International Hotel, Washington DC. 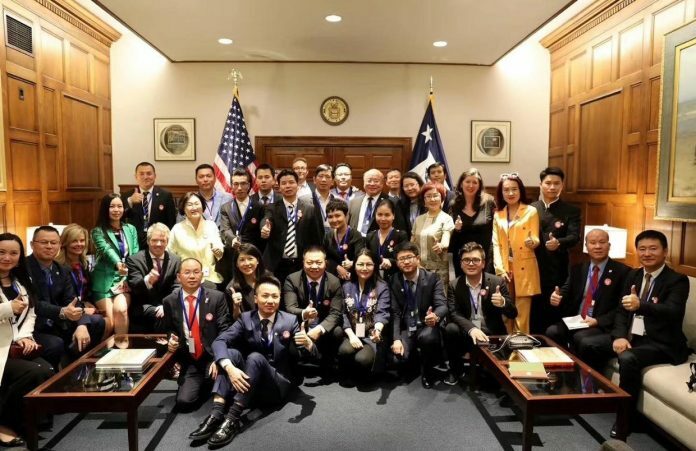 The Forum organized by the US China Business Association and the Shenzhen General Chamber of Commerce was attended by large group of hi-profile members and with many useful contents. The Trump International Hotel Washington DC was renovated from the 127-year-old Old Post Office. In 2013, the property was leased for 60 years to a holding company owned by Donald Trump and it became a landmark in Washington after its opening in September 2016. It is located near the White House, and the Capitol Hill, which makes this place a popular place for political dignitaries and celebrities. 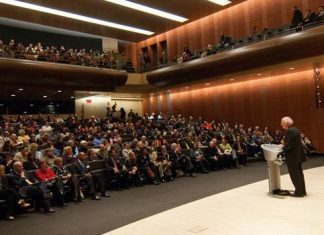 Three keynote speakers of national importance gave speeches in the forum. They are Mr. Edward Royce, the Chairman of the House Foreign Affairs Committee; Mr. Boyden Gray, the former U.S. Ambassador to the European Union and White House Counsel to President George H. W. Bush; and Mr. Michael Pillsbury, the Senior Fellow & Director of the Center for Chinese Strategy in Hudson Institute, the White House Adviser to Trump administration. Other officials such as Mr. Roel Campos, the former SEC Commissioner, Mr. Luis Fortuno, the former governor of Puerto Rico, Mr. Eric Branstad, the Senior White House adviser, Mr. Erin Walsh, Assistant Secretary for Global Markets and Director General of the U.S. Commercial Service in Department of Commerce and Ms. Christina Culver, the former acting deputy director in Department of Education and more than ten executives from Fortune 500 companies attended the forum. The purpose of this event was to set up channels for Chinese enterprises to connect the US government officials & business executives, and to match business opportunities. Nearly 30 business executives from Shenzhen attended the event as representatives from China. 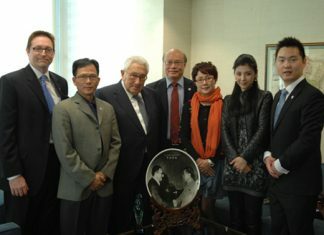 The U.S. China Business Association took the Chinese delegates and visited the U.S. Department of Commerce. During the tour, visitors and hosts were engaged in lively discussion about US-China investment, exports, tax, IPO-listing, economic and trade cooperation. The representatives from U.S. Department of Commerce expressed warmest welcome to the Chinese executives and spoke highly of the achievements of Shenzhen of the past 40 years. 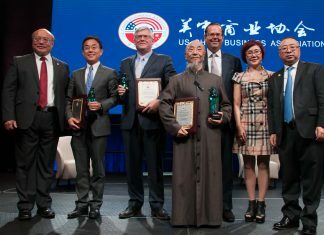 The US China Business Association spent several months preparing a special matchmaking events for the Shenzhen business delegates and tailored the needs to the US and Chinese companies. The events included live roadshows of more than 30 companies in medical equipment, online payment system, e-commerce, gold, silver, zinc and lead mining, holographic images, gaming, smart city, financial technology, leisure food and nutrition and so on. These young and active US based companies are looking for investment or partnership with enterprises in Shenzhen. 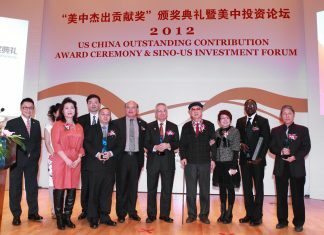 Both Chinese and American business executives would not loose any opportunity to network and communicate. In the three-hour long matchmaking session, each company rotated more than five times and talked to different presidents, CEO or company representatives from China. It was a very engaging and productive meeting. Some people even followed up with one-to-one negotiation after the matchmaking session ended. Shenzhen business delegates and executives from Morgan Stanley met at Morgan Stanley headquarter on twenty-seventh floor, where the breathtaking panoramic view of the busy Broadway and Times Square captured eyes of everyone. Shenzhen delegates were warmly welcomed at the world’s top investment banks like Morgan Stanley to seek high-level capital investment platform. Founded in 1935, Morgan Stanley is one of the world’s largest investment banks and financial services company, providing services in securities, asset management, merger and acquisition, and other financial services, with offices in more than 600 cities in 27 countries around the world. It is ranked seventy-sixth in the Fortune 500 companies. In Q&A section, both sides discussed issues concerning capital and investment in China, bonds, mergers and acquisitions, and others. Later in the day, Shenzhen delegates visited NASDAQ, the world’s largest stock exchange, located in the corner of the bustling Times Square. Joe, vice president of NASDAQ’s IPO listing, talked about IPO process, rules, fees, and with comparisons to the NYSE. He said NASDAQ welcomes Chinese companies to go public in the United States. We strongly believe in the near future; a large number of Chinese companies will become major players in the international capital market. The solid few days with programs of the US China Business Association has enabled Chinese companies to engage in dialogs with the US government, business and financial organizations at very hi-level. A good start is half done. The social, economic, and people-to-people ties between the American and Chinese provide a valuable basis for long-term relations. The Golden season brings forth the golden opportunities.